The correlation between the growing dry matter intake (DMI) and finishing dry matter intake was 0.56. 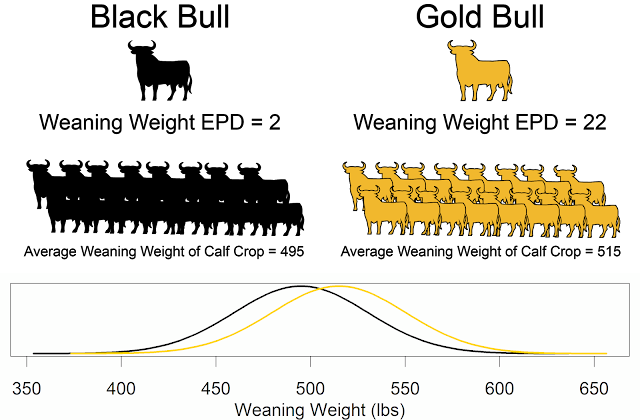 This means 56% of the variation is shared between the two feeding periods. Average daily gain is not that repeatable. The correlation between average daily gain in the growing period and the finishing period is only 0.11. However, residual feed intake (RFI), a measure of efficiency, is repeatable between feeding periods, with a correlation of 0.63. Using 35 days on feed accounts for about 95% of the variation in feed intake from a 70 day feeding trial. Intake seems to be very repeatable across stages of life and on different diets. 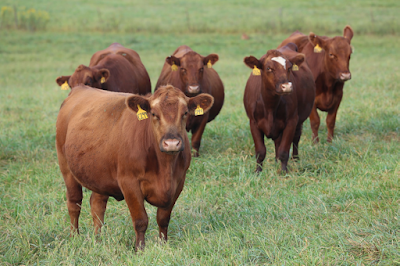 The residual feed intake (RFI) repeatability was 0.42 when comparing a forage diet to a grain diet. Intake is repeatable. Gain is not repeatable between test periods. Shorter duration intakes are strongly correlated to total feeding period intake. Intake of forage is correlated to intake of grain, furthermore efficiency is also correlated between forage and grain diets. This implies that intake and efficiency in the feedlot may have application to a cow-calf scenario.